I realized the other day that I have an unhealthy relationship with Citrus. It’s like one of those on-again, off-again marriages. I never really know when winter starts if I am going to have one of those years where I love citrus or one where I hate citrus. It’s truly unnerving how inconsistent I am. Last winter was definitely an on-again season. I was eating all of the oranges that came my way. This winter, however, I’ve been even more back and forth about it than usual. To start the season off, sometime back in November, I was at Meijer, and they had a 2-for-1 special on oranges. Usually, I wouldn’t even consider purchasing two bags of oranges. I would never get through them in a normal season. Something clicked in my head, and I ended up with a lot of oranges at home. Fortunately, it just so happened that these were some of the best oranges that I’d ever had (or at least since last winter), and while I did share them out, I did manage to get them all eaten. However, at some point just before Christmas, I purchased three lemons. I have no idea why. There was a good reason in there somewhere. Maybe I was going to zest them and some oranges and maybe some limes, and dehydrate the zest so I’d have delicious zest any time I wanted. I don’t think I was planning to make lemonade. That would have stuck with me. They’re sitting in my refrigerator, waiting for me to remember what I was going to do with them. But then for New Year’s, I picked up a box of Clemantines, and after they weren’t finished at the party I took them to, I feasted on them, multiple times a day until I ran out. (Which wasn’t that long, incidentally, because of the multiple feastings.) I couldn’t get enough of them. And so I thought I was having a good year for citrus. I bought another bag of oranges… and this time they’re just sitting there on my microwave. I even managed to finish a bunch of bananas before they all went black (which never happens) but my oranges just sit there. Every once in a while I’ll eat one out of obligation. I took one to work for an afternoon snack at some point last week, and I didn’t eat it until Friday, and then only because I needed a break, and peeling it would give me an excuse to get away from my desk. 1- I will always hate grapefruit. 2- I will always love lime. That’s all I really know. I wish my relationship with citrus could be as predictable as my relationship with say, apples, or cookies. (love both, by the way.) I have theories as to why it’s not. Most of them have to do with scurvy. 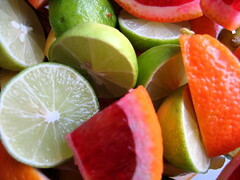 But at the very least, figuring out if I’m going to like citrus in a given year makes for an interesting guessing game.